Trying to find the best 1911 slide? It won’t be an easy task if you’re not exactly sure what to look for. You’ll want a slide that will work well with your gun so it can move back smoothly with every shot you take. Your goal is to make your 1911 function as best as possible. And you can’t do that with just ordinary stock or factory parts. Thankfully, we’ve handpicked four of the best 1911 slides currently on the market. This will give you an idea of what you can get without having to deal with the cheap models that will likely break or jam on you in a short amount of time. Let’s face it...you want a slide that is easy and smooth when you pull it back. Especially when you’re trying to load your gun or even disassemble it for the purpose of cleaning or installing other accessories. You don’t want it to jam on you each time you use it. A lot of upgraded 1911s will be smoother in movement compared to a stock slide. If there is one benefit that we want to enjoy aside from accuracy, it’s better control. You want a slide that won’t slip out of your hand every time you use it. While you’re in competition, controlling your 1911 is high at the top of your list of priorities. The last thing you want is to drop your weapon at a time when you need it most. Finally, you’ll want a slide that will benefit you in terms of accuracy. While having a good set of front and rear sights is fine, an upgraded slide will always play a role in making your 1911 a little bit more accurate. It’s important to look at some possible factors in choosing a 1911 slide before you purchase one. The not-so-smart thing to do is find one, pick it up off the shelf or click “buy now”, and call it good. Knowing what type of material your slide is machined from is important. That’s because you’ll want a slide that will sustain round after round, regardless of how often you use it. Whether you use it every day or every weekend, you’ll want a slide that will still function after you have fired off so many rounds. Most slides will have serrations in both the front and rear. This is designed to ensure that the gun does not slip out of your hand when your hands are sweating or if you’re in adverse weather conditions outside. This is something that you’ll appreciate if you’re a competitive shooter who is worried about your gun slipping out of your hand, especially at a time when the competition is on the line. One slip up can make the difference between winning and losing. If you want a good quality slide for your 1911, you’ll need to find one that won’t be a headache to install. Most slides will be easy to install with little to no gunsmithing skills to ensure a perfect fit. Sometimes, some filing or stoning may be needed. If the idea of installing a new slide intimidates you, you can always rely on a professional gunsmith to install it for you. Our first slide for review is currently the best overall on the market. This is brought to us by the Caspian. 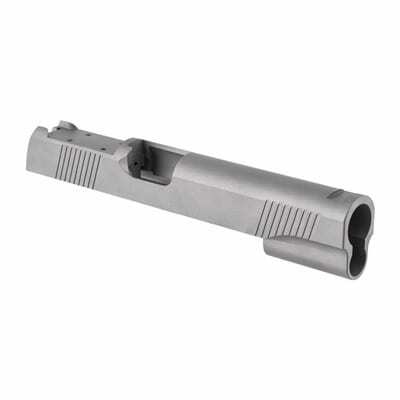 It is a custom-quality slide that is made to fit almost any 1911 frame. These begin as high-quality, extra strength forgings and are then heat-treated to RC 38-41 before being machined for superior stability. They polish the slides and bead-blast the rest of the surface for a non-glare, matte finish. The forward-angled, deep-cut rear cocking serrations are designed to help guard against slippage when you’re racking. Whether your hands are sweating or outside in rainy weather, you won’t have to worry about the gun slipping out of your hand. This is available in 4340 carbon steel and 416 stainless steel with breech faces in either .45 ACP, .40 S&W, or 9mm. If you’re looking for the commander and officers models, those are in .45 ACP only. Choose between two pre-cut dovetail options: a Bo-Mar BMCS or Novak Lo-Mount rear cut and a slide without side cuts. Both are coupled with a Novak front cut. The recon slide is a government slide with ball cuts at the front that line up with the light rail on the Caspian Recon frame. A slide that is crafted from carbon steel or stainless steel is guaranteed to be a super strong unit for your 1911. If you’re looking for a slide that will take beating after beating, the Caspian is probably your best choice for a slide. One of the other features that stands out best is the serrations that prevent the gun from slipping. If you’re outdoors target practicing or competing, you’ll want to keep hold of your 1911 when it’s raining outside. You can’t predict the weather, but you can be prepared for whenever it might do its worse. With that in mind, the Caspian will be your best competition buddy if you so choose. Every gun owner and enthusiast enjoys firing off a 1911 for their desired purpose. It doesn’t matter if you have enough money to play around with or if you’re on a budget, you deserve an excellent slide that will function quite well. If you’re on a budget, not to worry. There’s a slide that you can upgrade to without ever having to break the bank. 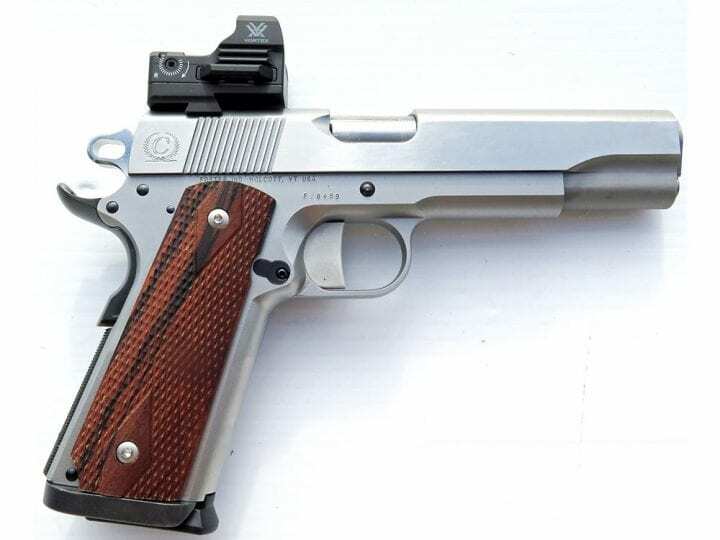 The Ed Brown brand is one of the most reliable among 1911 owners. And there’s a reason why that is. This is a government model that comes with the unique feature of being pre-cut for the Trijicon RMR Mounts with Integrated Sights. By including this cut, the slide will allow for a simple installation of the sight assembly & RMR optic. Other mounting options require an unsightly mount placed in the rear sight cut or sitting high on the slide. The Ed Brown 1911 RMR Slide saves time because you won’t need to machine the slide so you can install a unique Trijicon mount. What you’ll get will be a low profile, rugged optic & iron sight set up. This also features front and rear cocking serrations. 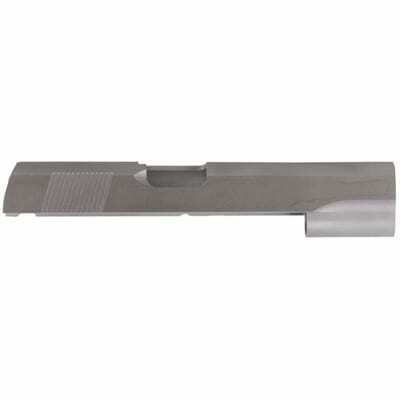 This slide is machined from forged stainless steel and is ready to be fit at any given time. Is having a slide still working after firing so many rounds high on top of your wish list? If so, then check it off. Because the Ed Brown 1911 Government Slide is just that. If you have a Trijicon sight, this is the perfect gun to mount it with. Not bad for a slide that you can get at an affordable price. If you’re on a budget and want a slide so good you feel like you’re getting away with stealing, get the Ed Brown Government Slide. If you’re looking for a long slide for your 1911, then you’ll want the Fusion Firearms six-inch slide. This product is completely assembled with a recoil system and is tested for maximum durability. Thick combat rear serrations, red fiber-optic front sight, and an LPA TRT fully adjustable rear sight are prominent features. These are precision CNC machined from solid 4140 Bar-Stock and heat-treated for superior durability from the company’s Diamond Series. The top ends come fully finished and assembled. Each slide is test fired on a slave frame to ensure that it will properly function. The entire assembly includes everything you need to make sure your slide is installed properly and with the greatest of ease. 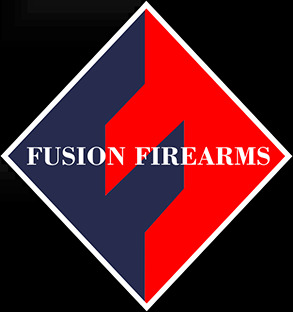 Fusion Firearms is a brand that you probably don't hear about. But not to worry, they do create high-quality parts for your 1911. If you place a high standard on accuracy and durability, there's a good chance that you'll be happy with something like the Fusion Firearms slide. 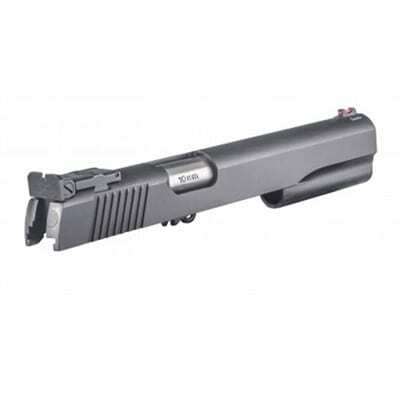 At six inches in length, this is for the owner who wants to upgrade their long slide. If you're on a budget, this is probably one of the best you can afford. For the last 1911 slide, we stick with the Fusion brand. This time, it is the five-inch slide. This is also the best slide if you're using a 9mm 1911. This is completely machined for .45 ACP or 9mm/38 Super caliber barrels. This slide is precision CNC machined from 4140 bar-stock and is heat-treated for maximum durability. This features thick combat front and rear serrations and standard dovetail. These slides are finished with an "in the white" style finish and are oil dipped. These have firing pin holes and the top ends are reamed to take the 9mm and Super 38 firing pin. This slide has the .45 ACP breech face so it will work with .45 cartridges without any issue. As stated in the previous review, Fusion is a brand that is worth getting to know and hear about even if you haven’t bought one of their accessories yet. 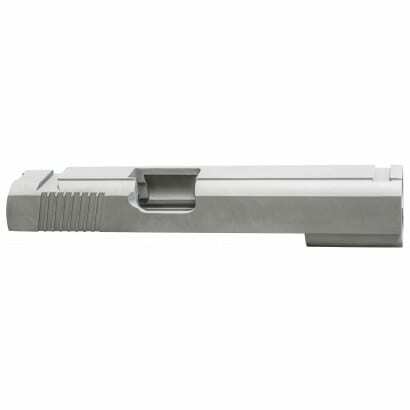 If you’re looking for a good slide that works with 9mm or .45 rounds, this is the type of slide you’ll need. Since it’s heat-treated, you’ll know for sure that this will take a serious beating no matter how much you use it. Don’t be surprised if it can still function very well after you fire off hundreds of rounds. If you’re looking for the best 1911 slide, be sure you know exactly what you’re looking for. Remember that your decision will come down to your personal needs and preferences. Also, you’ll need to find a slide that will fit the frame of your 1911 perfectly. So, be sure to choose wisely as you shop around.